A City of Delaware fire truck visited St. Mary School last Tuesday to collect the donation of toys. 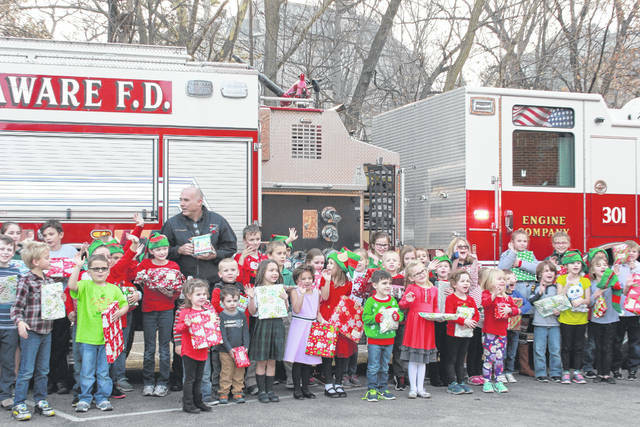 Fire Chief John Donahue said the toys were donated to the Salvation Army, which distributed them to the needy families in the community. Santa’s elves had a little help getting toys together this year thanks to the students and staff of the St. Mary School and their annual fundraiser that collected 400 toys. St. Mary School Principal Gina Stull said the fundraiser marked its fourth year and in the last two years they’ve allowed students to wear costume pieces like elf hats or ugly sweaters instead of their uniforms if they donate. Stull said the school collected toiletries and made Blessing Bags for the homeless, collected toys, and raised money. She said two firetrucks from the City of Delaware Fire Department came to the school last Tuesday to collect the donations. Donahue said he appreciates the community partnership around the holiday season. This entry was tagged St. Mary’s. Bookmark the permalink.